Posted on June 4, 2018 by MD Posted in International . The First Peace Pitch in Italy. 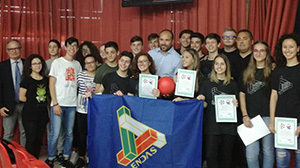 ENDAS Ente Nazionale, facilitated the first Italian Peace Pitch in Terracina. Peace Ambassadors from Leonardo Da Vinci school who represented their community at the 2017 Global Peace Games proudly presented the peace poppy ball to Terracina’s designated area of play – their new peace pitch – which is now officially twinned with Flanders Peace Field, Mesen, Belgium, site of the 1914 First World War Christmas Truces. The Peace Pitch is open to everyone, where the only goal is to socialize. Together with The National Children’s Football Alliance (UK) we help form the ever-growing International Children’s Football Alliance. (ICFA). An organisation that seeks to protect the universal interests of childhood through play. Two Peace Fields Project plaques where presented to the community in Terracina by students from Leonardo Da Vinci High School. The students represent Italy at the 2017 Global Peace Games where they participated in a peace education programme and gained recognition for their outstanding contribution to the United Nations International Day of Peace. The students gained competencies in conflict resolution, communication and equality. The boys and girls received their certificates and passed on their experiences to the new participants who will be attending in September 2018. John Carmichael, ICFA, NED, said, ‘The fact that young Italian people are taking the lead to promote peace to all members of the community – it is a very important message in the current world climate. We are very proud that they value the past through commemoration and celebrate the future , through play and promoting peace. 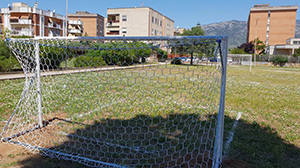 The Peace Pitch, Terracina. A Monument to Peace.